I love this startling image. Powerful, keeps you spell bound. It shows the late Polish surgeon Zbigniew Religa as he painfully monitors the vital signs of a heart transplant patient with outdated medical technology. The photo was shot in 1987 by National Geographic photographer James Standfield. The operation which apparently took 23 hours became the first successful heart transplant ever conducted. His assistant seems to be more wiped out than the patient and is huddled in a corner trying to sleep. This must have been great PR for Polish medicine. 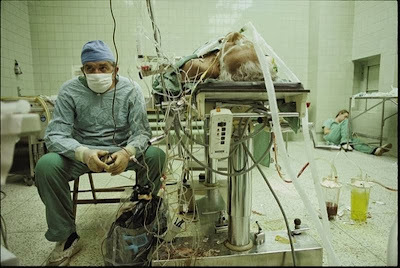 With an iconic image like that, you can't help but wonder how important a surgeon's job must be to society. His role is one free of prejudice and partiality. He offers his services to society regardless of caste, color, creed or financial status. Everyone knows what a surgeon does. Interestingly then, how can a surgeon be effective if he can't administer the highest quality health care with the best equipment? This actually became the focal point of the photograph. It drove home the need for the Polish government to do something serious about its ill-equipped hospitals which had evidently become something of a national crisis in the 1980s. With the help of a single photo, not only could people know what a surgeon did, they knew he was really struggling without the right technology! Some calculated risk taking and a lot of focus turned this feat into a successful operation after 23 hours, but surely the tables could have been turned. Technology amplifies the human. A man with the right tools for the right job is powerful. Its a great concept I borrowed and adapted from Mark Sanders, a well respected bicycle designer from the UK who said the same thing for bicycles - that it was a human amplifier. Extending this to the heart surgeon, this man wouldn't have been able to do his job without the engineered tools at his disposal. While a good number of medical technology was invented by medical professionals (and that helps every bit), a good bunch more were spurned by engineers. The Computed Tomography (CT) scan is one of the immortal tools at the doctor's disposal. Interestingly, tomography was invented by an electrical engineer Sir Godsfrey Hounsfield who was a weapons and radar specialist by profession. That's knowledge transfer for you. In a certain college class during my undergrad years, a well-known local resident by the name of Wilson Greatbatch was invited to come and speak to us (standing in the left photo in the blazer). This individual, an electrical engineer with some 300+ patents under his name, was a master's degree holder from the same institution I attended. Apparently, he had invented and brought to market the world's first implantable cardiac pacemaker many years ago which was considered one of the greatest engineering achievements in the U.S.
What was inspiring to learn in that talk was his acute awareness of society's needs, a trait highlighted by his willingness to tinker, to step outside traditional single minded engineering and study interdisciplinary areas such as medical electronics, agricultural genetics and the electro-chemistry of batteries. I'm sure anyone can dig up more examples like this given a bit more time but the point is that engineers are responsible for a lot of technologies that help other professions do their work. This importance of the profession and this symbiosis of tools and technology transfer is unfortunately living trapped in the whitepapers and webinars of engineering companies. Which gets me to a related topic which I believe don't sink much into a majority of people. Someone who cobbles up a gizmo in his basement from spare parts, then goes to a bunch of local vendors asking them to be partners whilst calling himself an engineer is over- stepping the bounds a bit. What about the engineering profession teaches you that creating a one-off piece in your basement is the same as producing a million of those a year for a real market need with a balanced structure of cost, performance and reliability? A starting invention is a proof of concept. Engineering obviously starts from proof of concepts but but there's a whole slew of engineering analysis, validation and judgment calls to make before a product can be deemed fit for market. So someone isn't an engineer and his invention is not ready for prime-time yet. This isn't elitism, more so an important distinction made between tinkerer and the spectrum of activities that constitute the engineering profession. Its also just as bad when the average Joe thinks that just because you're an engineer, you can fix his car. I think a fair number of us got that question more than once - "do you fix cars?" Well I would love to work on cars, but my profession doesn't teach me to fix cars or toilets. Its not what my job entails. I may have some insight into why the car isn't working if I had designed it, but I didn't design it. Besides, a very complex electro-mechanical machine like a car these days need its own army of specialized technicians who would know how to repair it. Engineers offer their services only where their expertise lies. Engineering will be helped by some honest PR. I'm not just talking about the "cool" gadget shows on TV that gets an anchorman to spend a bit of time talking about stuff or companies promoting the great works they hath done, like this new Volvo commercial with Van Damme and two trucks to highlight the safety of directional steering stability. Rather, something at a more grassroots level to highlight the work of engineers as we all seem to be a modest bunch who like hard work but don't like to take credit. But engineers could start with some evangelism themselves. At a recent chartered engineer's meeting in Abu Dhabi, IMechE president Patrick Kniveton who was the guest of honor really drove home the need for us engineers to start talking about who we are and what we do at any appropriate opportunity. This bit is possibly essential if we have to correct people's thinking about what we do and at the same time, inspire them to an extent. Anyone can read Mr. Knievton's Presidential Address titled 'Proud to be an Engineer'. If you have any experiences to share on this interesting (but oft beaten to death) topic, do chime in.